Just over a month ago, it is safe to assume only those with a distinct knowledge of the depths of Newcastle's team would be aware of Sean Longstaff. Today, he will play at Wembley with his boyhood club, days after being praised by Pep Guardiola for helping stop his Manchester City side in a famous 2-1 win for Newcastle. A product of Newcastle's youth academy, the 21-year-old midfielder has started their last three Premier League games, helping them move five points away from the relegation zone. 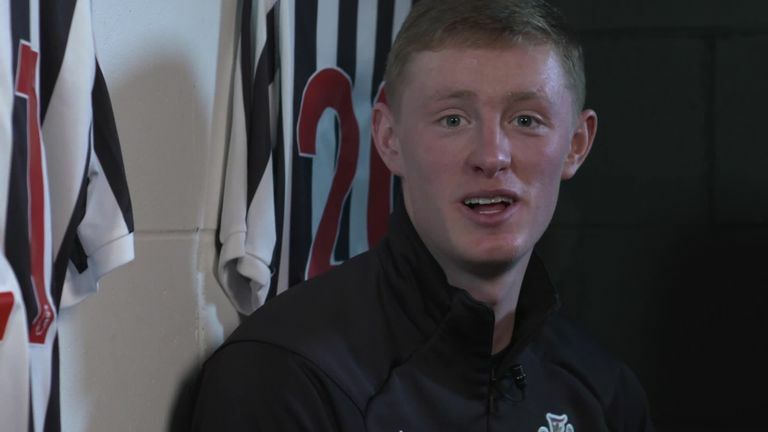 In an exclusive interview ahead of Newcastle's clash at Tottenham live on Sky Sports Premier League on Saturday at 12.30pm, Longstaff took us through his early days at the club, when success was a little easier to come by. "I was about five or six when I went to the little foundation camps. I got into the academy when I was nine, and I've gone through every age group since and into the first team. There's a lot of hard work still to go to make sure I stick around! "When you get to 11, 12 you start to realise how big [the club] is. You start going to games when you're younger but you think it's the norm that every football club in the world has that many fans, but as you get older you realise they don't! And you realise just how big a club Newcastle is. "I had a DVD and I think it was called Newcastle United: Flying High in 2002 or 2003. I used to watch that all of the time, I think it was the year Shearer scored that famous volley against Everton. You start going to games when you're younger but you think it's the norm that every football club in the world has that many fans, but as you get older you realise they don't! "I watched that and thought I'd love to be in that position one day. So I remember the club being successful when I was younger, but unfortunately we've had a few bad years, it's been a bit up and down, but hopefully we've got the right manager in place to give us a bit of stability and hope it can bring success in the years to come." Newcastle's fine comeback victory over champions City brought specific praise from Guardiola for Longstaff and fellow central midfielder Isaac Hayden, admitting they "could not deal" with the duo. For Longstaff, the praise was flattering, but he is keen for credit to be spread throughout the team and the manager. "Obviously when someone like him, probably the best manager in the world, says nice things about you, it always makes you feel good, and gives you a little boost and confidence to know you've caused a team like that problems," he added. "But it wasn't just me and Isaac, it was everyone, it was probably the shape of the team, the way the manager set-up, it was a group effort. But when Pep can give you the praise, you'll always take it, and it was an unbelievable feeling." Longstaff, the son of former Team GB Ice Hockey captain David and nephew of former Newcastle, Celtic and Aston Villa midfielder Alan Thompson, has plenty of figures around to keep him grounded. Asked if the footballing world feels like his oyster at the moment, Longstaff is determined not to get ahead of himself. "Not for me, there are too many people around me who wouldn't let that happen, it wouldn't be right for me to get above my station when we're in the position we're in," Longstaff said. "There are enough strong people around me, and particularly in the dressing room that wouldn't let it happen. As much as it's going great at the minute, it just takes one thing for it to start going the other way. "It's been great to play against the top teams in the world, it can only benefit me. As a 21-year-old lad, from last year watching them on the tele, to this year being up close and personal with them, it's a little bit surreal, but I think it's something that I try to take in my stride. "Sometimes you do look around and think: 'How has this happened in such a short space of time,' but I'm loving every second of it."